View a sample of the video files that accompany the BASIC exercises. Please view the Read Me First file to get proper instructions then download the appropriate files from the list to the right. 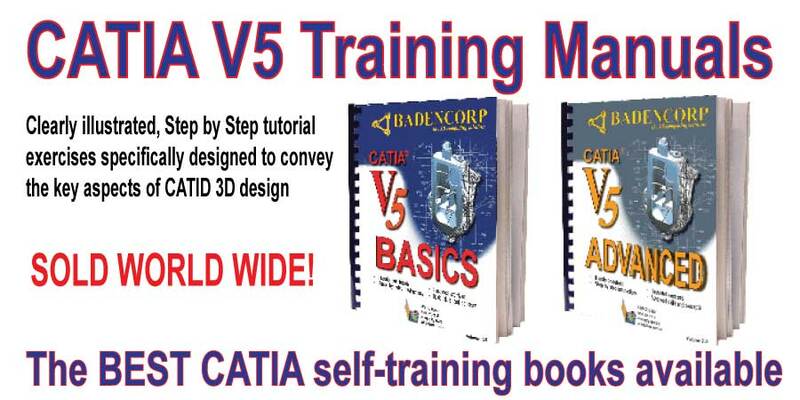 Intuitive, easy to use V5 Basic manual for beginners & experienced users alike ONLY $89.95 plus shipping!! Contact a Badencorp representative for special pricing on volume purchases! Please add $9.95 per book for shipping and processing. You can place your order by credit card. We use PayPal for your protection. Thank you for your interest in our training material. DISCLAIMER:This manual is current as of CATIA Version 5 Release 19. Purchase of this manual is a one time event. CATIA is constantly evolving, every new release introduces new functionalities and updates existing ones. The purchase of this manual does not constitute any right to future updates of the manual. BADENCORP will be releasing revisions to the manual and associated materials as required. These revisions will be available as new issues of the manual.